think its a dip ? Is this stocked in a chiller cabinet or on the shelf in Tescos? In Nandos restaurants they keep it in the fridge so hope it is the same for this. 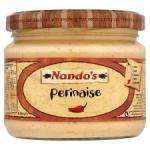 It's just on the shelves...not near the mayo but the Nandos section. Bought one on Friday but it was £1.69 then. Yum. You put in the fridge once it's open like normal mayo. They only put it in the fridge coz it's in plastic packaging rather than this in glass. OMG!!! This stuff is amazing! OMG as well! Need to get some, this stuff is lovely with chips! haven't tried this before, will buy and try. Thanks for posting, heat added. really nice actually, not a fan of nandos but i love this dip/sauce. You'd have to be a bit daft to vote Nando's "cold"
However, that'll be why there was non on the shelf at the Durham Extra/Dragonville store last night! There was even a sticker saying "next available 16/10/2010"
Awesome sauce, you can buy it in massive jars in South Africa but never seen it for sale over here before except in Nandos itself. Looking forward to buying some of this! They only just started selling it again a month or two ago after selling it in shops a few years back, hope the reduced price isn't because of lack of sales and it gets pulled again because it's amazing! None in Northampton. £1.79 on shelf label but nothing left. I guess this is end of line as no other Nando products are on offer. Found these today but the BB date on them was 11/10/10. Thought that was why the offer was on, but it says running till 2nd or 3rd Nov or something, so will try again someday and see how good this tastes. Ive got high hopes after all the recommendations in here.